EastWest has released Hollywood Solo Cello, part of the Hollywood Solo Instruments series designed to work with their flagship Hollywood Orchestra. EastWest has announced new Hollywood Solo Instruments for Composer Cloud Subscribers: Hollywood Harp, Hollywood Solo Cello and Hollywood Solo Violin. Fluffy Audio released the second volume of their Trio Broz string trilogy, which is dedicated to cello. Best Service keeps on launching the new sound collections they introduced at Winter NAMM. You can now purchase Emotional Cello. You can now get three sections of the Aria Symphonic Strings virtual orchestra for Kontakt. 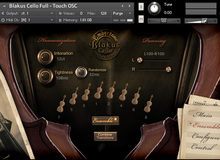 Following the Solo Violin, 8Dio launches a new Designer library for Kontakt 4 and 5 dedicated to the cello orchestral instrument. Best Service announced at NAMM 2015 the upcoming release of five new sampled-instruments, including three upgrades. Cinesamples listened to their users and now offers the Acoustic Cello Legato patch from the Tina Guo collection separately. Following the violin section, 8Dio is about to release the cellos of its new Agitato Series, still for Kontakt 5. 8Dio has announced that they will be releasing Adagio Cellos in the coming weeks, a new library for Kontakt(4.2+).